My favourite Shankar Jaikishan albums tend to feature their trademark blending of traditional Indian sounds and imported music styles, most of them from the latter half of the 1960s. But seeds were being sown earlier, plainly heard on these two wonderful scores from 1962. Stylistically and in terms of quality there's not a lot to separate the pair. 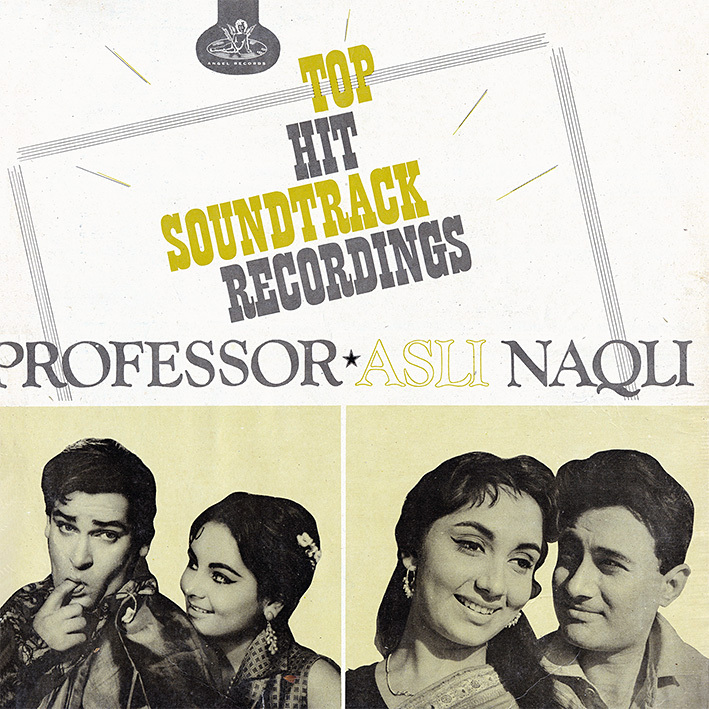 The award winning soundtrack for 'Professor' [review] contains 'Khuli Palak Me Jhuta Gussa', a superb Mohd. Rafi track with a catchy melody and a great Latin beat. The delightful duet 'Main Chali Main Chali' is similarly irresistible. Sunny sounding 'Hamre Gaon Koi Aayega' and the more melancholy 'Aawaz Deke' invoke tradition; both are fantastic. And the songs on 'Asli Naqli' follow suit. 'Kal Ki Daulat Aaj Ki Khushiyan' and 'Gori Zara Hans De Too' are zesty and cheerful and contain hints of the exuberant rock 'n' roll numbers that would come a few years down the line. 'Lakh Chhupao' and 'Tera Mera Pyar Amar' are appealing Lata Mangeshkar showcases, the first playful and flirtatious, the second an atmospheric mid-tempo ballad with a French tinge. Thanks PC for Asli Naqli Songs Dedicated to The Memory of Great Actress, Fashion Icon and Trendsetter, Beauty Queen Sadhana Shivdasani.